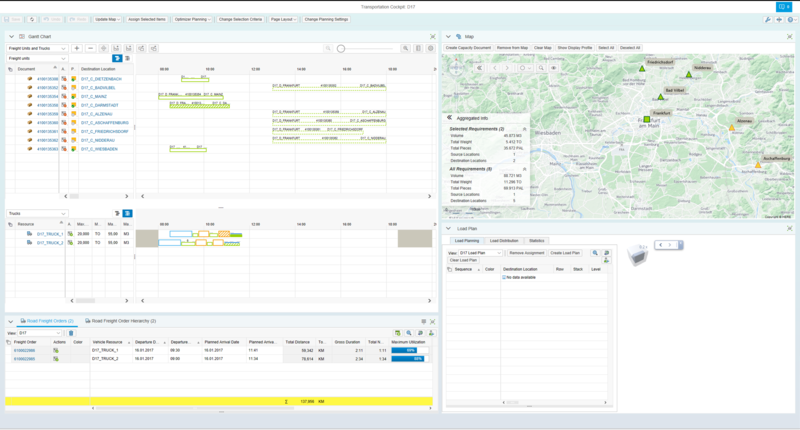 I had already explained our road map for the geo-map usage in SAP Transportation Management with MKS68. 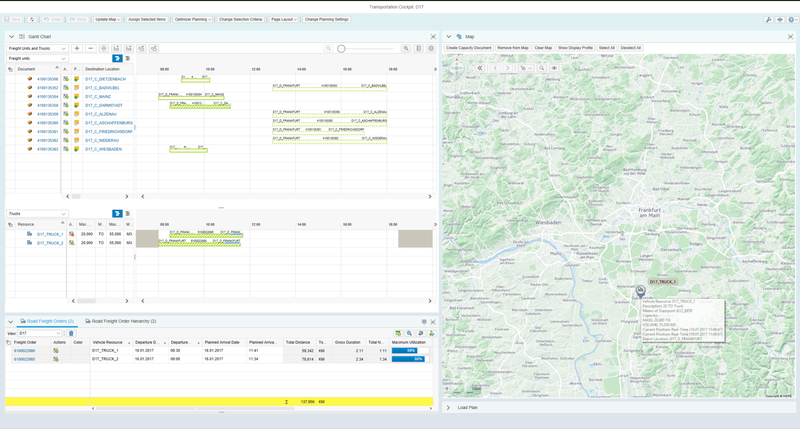 Today I want to focus on the map based planning in a local distribution scenario using SAP TM 9.4. To me this scenario brings together all of our visual components nicely integrated in the Transportation Cockpit (for the flexible layout definition refer to MKS67) and shows the power of manual planning. The demo was presented at the SAP DKOM 2017 in Karlsruhe, so it is fresh from the shelf. First after starting the Transportation Cockpit we take some time to check what is in there. On the top left side we can see the TM Gantt chart component showing in the upper area the transportation demands (Freight Units). We can see the already planned activities and still unplanned demands. 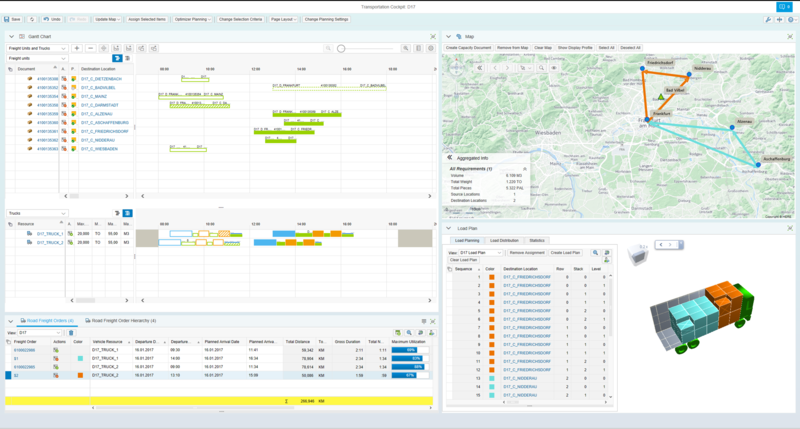 In the lower area of the Gantt chart we see our trucks, that can be used to handle the demands today. For each truck we recognize the already planned tours. Looks like we planned the morning pretty well. On the left lower side the Road Freight Orders can be checked with their start and arrival time. In addition, we see the tours are utilized okay. 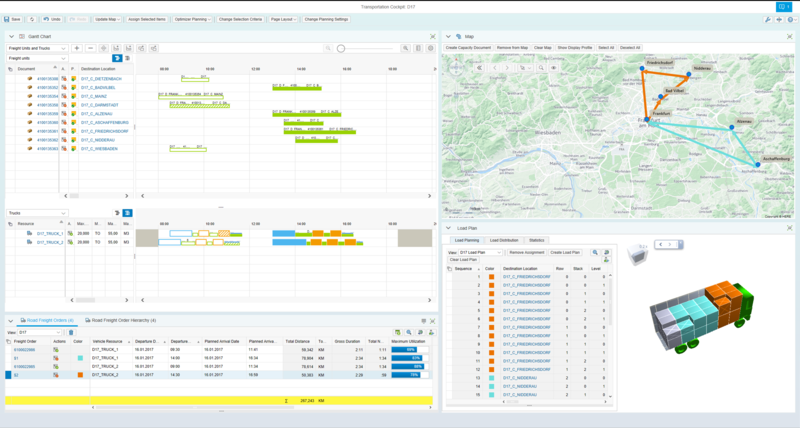 On the right side we see the geo-map component using SAP Visual Business (and map content from HERE). I already added the first truck to the display. It is visualized at it’s current position. To get more details for one of the already planned torus, we add it to the map by using the truck context menu functon ‘Find Documents’. It gets displayed and the color is linking it to the table. In the Gantt chart we switch to the activity view and can see loading, transport, and unloading activities in detail. The shading gives us a hint if the activities are planned, executed, or currently in process. We select the road freight order in the table and open the Load Plan area. Here we get the load plan and the colored 3-D model. With a single look the planner can check if this plan is okay. The pallets are colored by their destination location. Now we start planning the afternoon. We add all transportation demands to the geo-map using the global toolbar function ‘Update Map – Clear Map and Show Selected Entries’. We recognize a detailed information window showing us some capacity and geographical data. We select nearby demands using the lasso selection feature of the geo-map. After doing this, the details get updated with the selected capacity that is required. We pick the first truck that gets available in the afternoon and assign the selected demands. The system creates a new road freight order, that is added to the Gantt chart, geo-map, and list. We select it and see that already a load plan was created (the load planning feature was added to the manual planning strategy). The truck looks well utilized. So we continue to plan the rest of the demands and create another road freight order for the second truck. We do this by selecting the 2 demands in the north in the Gantt chart and assign them to the truck using drag and drop. We left out the demand for Bad Vilbel by intention and check the created freight order. Note that we switched to a straight line display for the tours. The load plan shows us that the truck still has some free space, so we add the last demand using drag and drop on the map. We drop it onto the first stage, the freight order gets extended and the load plan is updated. In this very simple scenario already a lot of the map configuration and manual planning features are included. It can be tweaked into a lot of direction, which I might demonstrate within the next weeks. For example the way how the demand is visualized can be completely different for example in a overland planning scenario. Hope this gives an insight of the power of our visual components.